The amount you pay will be the price indicated plus any delivery charges (if applicable). All transaction charges by PayPal are fully borne by L'zzie.com should you choose to make your payment via PayPal. All products on www.Lzzie.com are available in basic sizes of S, M, L, and XL, unless otherwise stated. Measurements provided are general guidelines to facilitate your buying process. Please allow for up to an inch difference. Garments are lay flat and measured across. 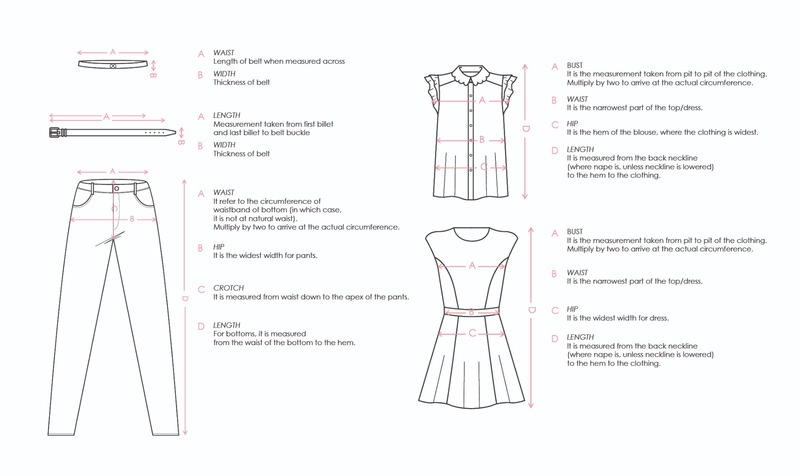 To derive at actual circumference or length of garment, calculations may be required on your part. All measurements given are in centimetres (cm). Therefore, kindly refer to each individual product measurement to derive a more accurate representation. It is advised that all products purchased from L’zzie be hand-washed. Delicate fabrics, such as chiffon or lace will require gentle washing. Do not spin or tumble dry garments unless stated. If you require any further assistance, kindly drop us an email at customercare@lzzie.com and we will get back to you the soonest!